"MYPLACE explores how young people's social participation is shaped by the shadows (past, present and future) of totalitarianism and populism in Europe. Conceptually, it goes beyond the comparison of discrete national 'political cultures' or reified classifications of political heritage ('postcommunist'/'liberal democratic'); it is premised rather on the pan-European nature of a range of radical and populist political and philosophical traditions and the cyclical rather than novel nature of the popularity they currently enjoy. Empirically, MYPLACE employs a combination of survey, interview and ethnographic research instruments to provide new, pan-European data that not only measure levels of participation but capture the meanings young people attach to it. 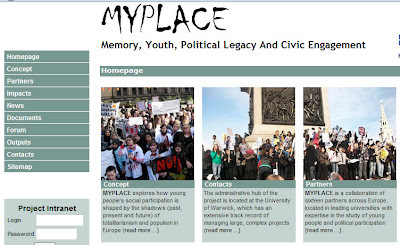 Analytically, through its specific focus on 'youth' and the historical and cultural contextualization of young people's social participation, MYPLACE replaces the routine, and often abstract, iteration of the reasons for young people's 'disengagement' from politics with an empirically rich mapping of young people's understandings of the civic and political space that they inhabit. In policy terms, MYPLACE identifies the obstacles to, and facilitators of, young people's reclamation of the European political arena as 'my space'." Want to find out more? Go to the project website here. What do children and young people in Georgia need to be well and happy? Public opinion polls consistently show that the majority of Georgians want to be a part of the European Union. Young people in Georgia are especially pro-Western, often claiming to share the same values as their peers in the West. Getting to the streets: Who is more inclined to protest in Georgia? This blog post has shown that those that recently participated in public meetings or rallies, as well as more educated and wealthy Georgians perceive peaceful demonstrations as more efficacious in affecting government decision-making, compared to those who have not recently participated in meetings or rallies, are less educated and are poorer. The blog analyzes if the special precinct really mattered for the Sagarejo by-elections or wether it was the ethnic voting patterns, which explain the differences. Can’t get no satisfaction. Who doesn’t want to join the EU? On December 30, 2013 Davit Usupashivili, Chairman of the Parliament of Georgia, declared that Georgia’s top priority for the year was the signing of an Association Agreement with the EU. If signed, the association agreement will enable closer ties between Georgia and the EU. Today, less than democratic regimes face a serious dilemma – how do you buy votes to win an election without becoming an international pariah. Unfortunately for a society and fortunately for an autocrat, the wheels of power and administrative resources an incumbent regime wields provide ample opportunity to manipulate electoral outcomes through what are otherwise legitimate activities related to state spending and coercion. The Georgian parliamentary elections in October 2012 attracted much international interest and ushered in an important turn in Georgian politics. In 2012 CRRC conducted four waves of a Survey on Political Attitudes in Georgia for the National Democratic Institute (NDI) (funded by the Swedish International development Cooperation Agency-SIDA) in order to track changes in public opinion associated with these major political events. Note: This blog is re-posted from the MYPLACE project's blog. The original MYPLACE blog can be found here. The Merriam-Webster dictionary defines abortion as a “termination of a pregnancy after, accompanied by, resulting in, or closely followed by the death of the embryo or fetus.” According to the United Nations' publication, World Abortion Policies, 2011, by 2009 roughly 97% of countries in the world had made abortion legal to save a woman’s life. Dustin Gilbreath, a Research Consultant at CRRC-Georgia, has written electoral notes on yesterday's municipal elections which were published on the web-magazine Liberali.The notes discuss the results of the elections, background and significance, changes to electoral legislation, the pre-electoral environment, capital candidates and campaigns, and outlook for the Georgian Dream Coalition and United National Movement. To read the electoral notes, please click here. On June 15th Georgian voters headed to the polls in local elections. There were problems leading up to the elections as detailed in last week's electoral notes. At present, results show a significant portion of positions in local government going to Georgian Dream Coalition (GD) candidates, though a number of races will go into second rounds. On July 28, 2014 charges were announced against the former Georgian president Mikheil Saakashvili concerning the abuse of power. These charges make Saakashvili the highest public official from the former UNM government to be summoned by the prosecutor’s office to date. Following 2012 parliamentary elections, attitudes toward Russia in Georgia shifted. While in 2011 51% of the population considered Russia the main enemy of the country, in 2012 only 35% reported the same. Moreover, the share of Georgians who named Russia as Georgia’s main friend increased by 5%. In a post on the CRRC-Georgia blog, this change was explained by a so-called “spiral of silence”. As of June 1, CRRC has started work on a collaborative project on youth engagement, called MYPLACE. MYPLACE is an FP7 Collaborative Large-scale integrating project funded under the 2010 Social Sciences and Humanities call ‘Democracy and the shadows of totalitarianism and populism: the European experience’. It brings together a consortium of 16 research institutions from 14 European countries as well as 14 stakeholder public institutions (museums, NGOs, archive and document centres). In the spring of 2011, CRRC ran the Caucasus Barometer Report Writing competition and now we have an opportunity to present some of the results to you. The first report is written by one of the competition winners, Keti Khachidze, and addresses trust in the Georgian president. Here is a quick summary of her findings and analysis. During the last 25 years Georgian capital has experienced a diverse history of political meetings in its central areas including peaceful demonstrations, rallies with radical political demands, “tent towns” and so forth. The higher the attendance, the more legitimate the protests are often seen to be. As a result, the figures themselves usually are contested, sometimes in significant controversy. As Georgia seeks a course of European integration and eventual membership in the European Union (EU), it is important to examine the Georgian population’s understanding of its own identity. CRRC data from a 2011 survey entitled Knowledge and Attitudes toward the EU in Georgia shows that a majority of Georgians (88%) think Georgia should be in the EU. In September 2011, CRRC on behalf of Eurasia Partnership Foundation and EWMI G-PAC conducted a nationally representative survey on Volunteerism and Civic Participation in Georgia. Georgians were asked how often they get together and discuss private problems and politics with their friends and relatives (who do not live in their houses). Alpha Version of CRRC Data Initiative now online!!! The alpha version of our Data Initiative data set, broad household data, covering lots of household data, but also political attitudes, social development, some health, education, migration, and social capital questions (and more) is online now. We interviewed more than 8000 people, so this really is the single largest dataset that is available on developments across the South Caucasus. Admittedly we forgot to post this earlier, but we believe it is even more important with the upcoming elections in Georgia. With today's elections in Georgia, various themes come to mind. Certainly, elections have come a long way: by now, the Georgian government employs a series of highly qualified consultants, including Greenberg Quinlan Rosner of Clinton-fame, plus a Brussels-based PR firm, as well as working with experienced teams from the Baltics. This, then, is no longer the game of the 1990s, or 2003. Election observers know that they in turn will be observed, and maybe that's how it should be. Yet another survey has been sent around as a PDF in Georgia. The survey attempted to measure the postelection mood in Tbilisi. According to the information provided in the PDF, 503 respondents have been selected randomly and interviewed by telephone. According to the results 46.92% of respondents say they "fully disagree with the announced results of the 2008 parliamentary elections". 25,65% say they totally agree with the announced results. We have been asked to comment, and some of the things we have to say will sound pretty obvious. Women’s participation at all levels of elections in Georgia is diminishing. As the Caucasus Women’s Network (CWN)reports, women inGeorgia were less represented in terms of candidates in the last parliamentary elections than in any previous parliamentary elections inGeorgia’s democratic history. On the other hand, women’s low political participation in elected bodies belies women’s activeness in civil society institutions, where females appear to be very active. Georgia Post-Conflict Phone Survey | may be a first glance? Georgian IPResearch (first time we heard of them, actually) conducted a phone poll between Aug.25 and Sept.2. 450 respondents were questioned countrywide. While we have our strong reservations about these telephone polls (they are biased towards people with phones, picking up calls from strangers, and bored enough to chat), they may serve as a preliminary indication. World Press Freedom | Caucasus does badly! Yet another index, and one with little happy news. How does world press freedom look? Reporters Without Borders, an advocacy group founded in 1985 ("investigate, expose, support"), has just released an international ranking. A total of 173 countries are ranked, and the Caucasus is in the bottom third. The Georgian Research Institute on Addictions (GRIA) in 2003 conducted a survey of about 700 students in Tbilisi's universities. Exit Polls | a good idea? With upcoming elections in Georgia, the attention is back on a theme that otherwise often gets neglected: what does the Georgian electorate want? In May 2007, the World Bank released a two volume report on Armenia's labor dynamics (click here for the overview page). Unfortunately, most of the report is based almost wholly on Armenian National Statistical Service (NSS) data from 2003 and 2004. Given the problems with Armenian statistical data and the fact that the statistics may already slightly outdated, the results should be read critically. Unemployment following the collapse of the command economies in the Caucasus has had consequences far beyond the traditional questions of income. Unemployment affects people’s psychological condition and, on a more basic level, the very fabric of society. With all the attention on Georgia, it may be interesting to revisit Georgia's most recent performance as seen by international organizations. As it happens, the Millennium Challenge Corporation offers a such an assessment through its annual scorecard, just released last week. This scorecard is a meta-index, drawing on data from the World Bank Institute, Freedom House, IFC, WHO, UNESCO and a few other organizations. The results of the 2016 Parliamentary elections in Georgia reveal some interesting patterns about the representation of women and ethnic minorities in Georgian politics. Bidzina Ivanishvili resigned from the post of prime minister of Georgia on November 20th 2013, and in his own words, “left politics“. Speculation about his continued informal participation in the political decision-making process began even before he resigned and still continues. Some politicians think that Ivanishvili gives orders to the Georgian Dream party from behind-the-scenes, while others believe that he actually distanced himself from politics. Politicians, journalists and experts continue to discuss the situation. Meanwhile, a majority of Georgia’s population thinks that Bidzina Ivanishvili is still involved in the governing process and that his informal participation is unacceptable. In general people are primarily interested in their own lives, rather than in social or political events. In other words, social and political events will, most probably, be overshadowed by events in one’s personal life. CRRC’s 2015 Caucasus Barometer (CB) survey data provides more detailed insights on this. In this blog post, we compare answers to two CB questions: “When you get together with your close relatives and friends, how often do you discuss each other’s private problems?” and “When you get together with your friends and close relatives, how often do you discuss politics / current affairs?” in Armenia and Georgia. Do voters in less than democratic contexts matter or are elections simply facades used to create a veneer of democratic accountability for domestic and international actors? Within the Autocratic Response to Voter Preferences in Armenia and Georgia project, funded by Academic Swiss Caucasus Net, CRRC-Georgia and CRRC-Armenia aimed to help answer this question, at least for Georgia and Armenia. On October 27, Caucasus Survey published the results of the project in a special issue, available here. In 2011-2015, CRRC-Georgia was involved in an EC-funded project MYPLACE: Memory, Youth, Political Legacy and Civic Engagement. Sixteen academic partners from 14 countries (see the map below) investigated the forms and causes of young people’s civic (dis)engagement across Europe. Stereotypes are an inseparable part of every society, and present in many parts of everyday life. Georgian society is no exception in this regard. For example, some professions like teaching are stereotypically thought of as “women’s professions” while others like being a soldier are considered “men’s professions”. The media is considered one of the strongest means through which stereotypes are strengthened or broken. In Georgia, TV is the most important media, given that according to CRRC/NDI data, 73% of the population of the country name television as their primary source of the information. In order to understand the dynamics around gender-based stereotypes on TV, CRRC-Georgia monitored the main evening news releases and political talk shows broadcast during prime time (from 18:00 to 00:00) on five national and three regional channels from September 11 to November 12, 2017 (Channel One of the Public Broadcaster, Adjara, Rustavi 2, Imedi, Maestro, Trialeti, Gurjaani, Odishi) with the support of the UN Joint Program for Gender Equality with support from UNDP Georgia and the Swedish government. What are young people’s values and how are these different from older generations’ values in Georgia? As Georgian society is going through social and cultural changes, it is important to understand people’s beliefs and values. Comparing the values of young people to those of the older generations is also important. This blog post summarizes the findings of a study that examined the values of young people aged 18 to 25, and analysed how these values are different from the values of older people in Georgia, based on both quantitative (World Values Survey, 2014) and qualitative data (40 in-depth interviews conducted in 2016). The study looked at values, perceptions, attitudes and tolerance towards different minority groups in Georgia. It concludes that in many cases, the younger generation shares more modern views and values, while the older generations are more inclined to support traditional values and hold conservative points of view. On 13 February, the United States released its Worldwide Threat Assessment of the US Intelligence Community. In it, the significance of Russian influence operations in Georgia were highlighted. Just eight days earlier, on 5 February, a coalition of Georgia’s leading non-governmental organisations made an official offer to support the Government of Georgia, the EU, and NATO in their efforts to counter anti-Western propaganda. Choosing a profession: who should decide young people’s career paths? Choosing a career path is one of the most important decisions that people make in their life. For some, it might be a complicated and anxiety-riddled experience. One reason is that the process of choosing a career begins at a young age when a person may not have thought about what they want to do with their lives. For this, among many other reasons, parents often play a role in deciding what their children study at university, which is often though not always associated with their profession. However, there are a number of arguments about why it is better to allow a child to choose their own career paths. Based on the CRRC/NDI June 2018 survey, this blog post describes the adult population of Georgia’s views about whether parents or their children should choose their career, and describes how opinions differ by a number of demographic characteristics.